This post is sponsored by RIU Hotels & Resorts who I love for their amazing all-inclusive hotel! Seriously, had the most fun ever. Almost didn’t come home. I’m now officially home, and back to work, cooking, recipe testing, blogging, social media-ing, and all things that make up my life as a food blogger. Woot! 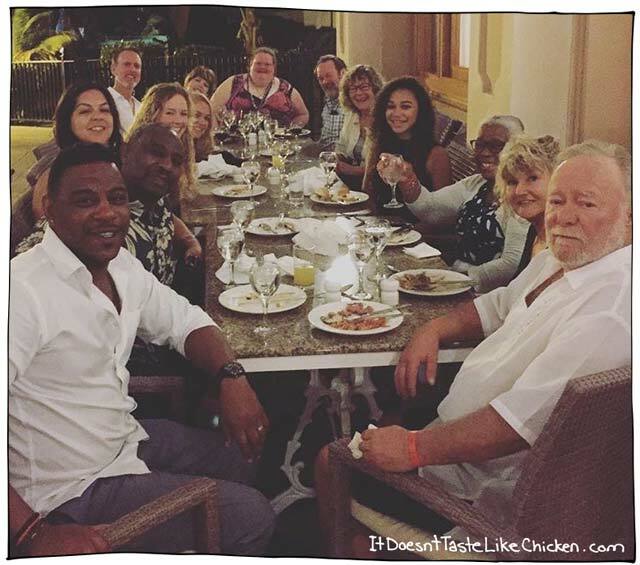 I went on vacay with 13 other family and friends to Jamaica, and we stayed at the RIU Montego Bay. Aren’t we the cutest? Yes, yes we are. 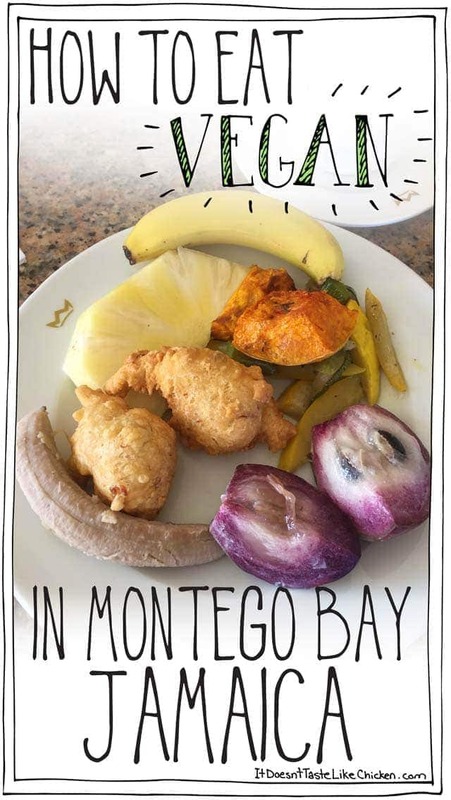 But of course this blogging obsessed chick couldn’t resist but share all my experiences with you, so I documented (mainly my food) of the trip so I could share with you How to Eat Vegan in Montego Bay, Jamaica! See, so darn pretty. I just love Jamaica. It was my first time ever staying in an all-inclusive hotel, and I gotta be honest here. Before this trip, I was totally anti all-inclusive. I always preferred Airbnb or small hotels, because I wasn’t one of those touristy people. Well, it turns out I was ALL WRONG. 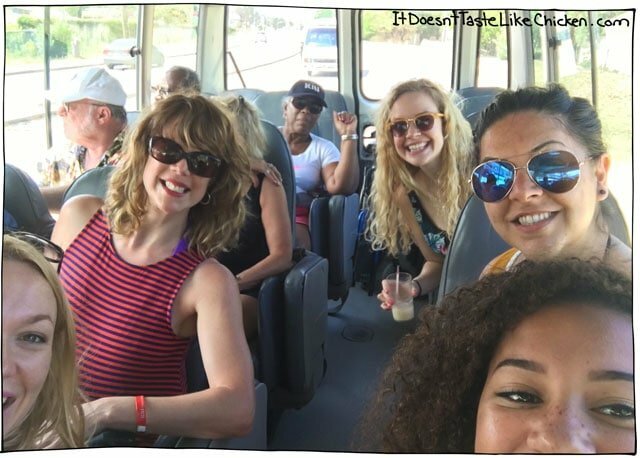 It turns out that I loved the all-inclusive resort so very much, and I’m now totally one of those touristy people – and by those touristy people I learned it was people who wanted to just relax, have fun, and have no worries. Yep, I’m totally that person. With 14 of us on the trip, and the ages ranging from 14 all the way to about 70, it made the trip so easy peasy. There was no organising, no trying to schedule everyone, now worrying about people getting hungry. There were fabulous shows every night, lots of fun activities going on, endless cocktail creations, it was just great. And not to mention, the food was fantastic!! Everything was taken care of, so there were no worries, all there was to do was to decide what day trips to do! (If you wanted to do anything at all). 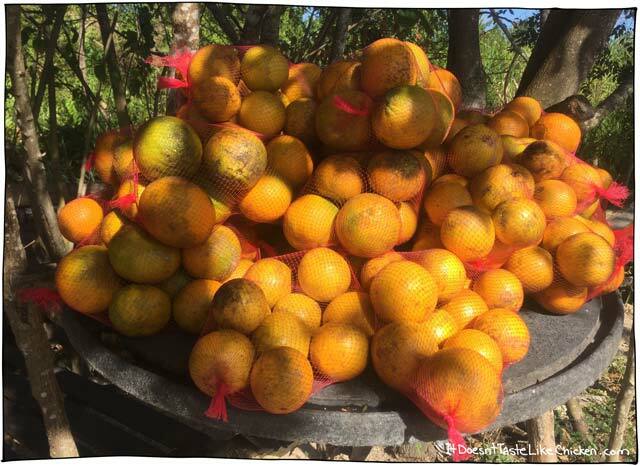 One of my favourite things about Jamaica is that there is an abundance of fruit everywhere. It’s literally just falling from the trees. Dream world, I’m telling you. I made sure to stop at this place on the roadside that was selling jelly coconuts. And by place, I mean an area among the trees that happens to have a fridge plugged into the ground… where the power was coming from was beyond me. 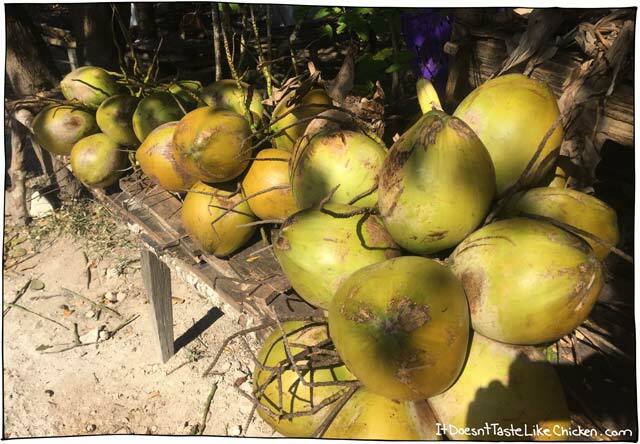 Unlike the firm coconut meat we are used to in Canada, jelly coconuts are picked when they are younger. 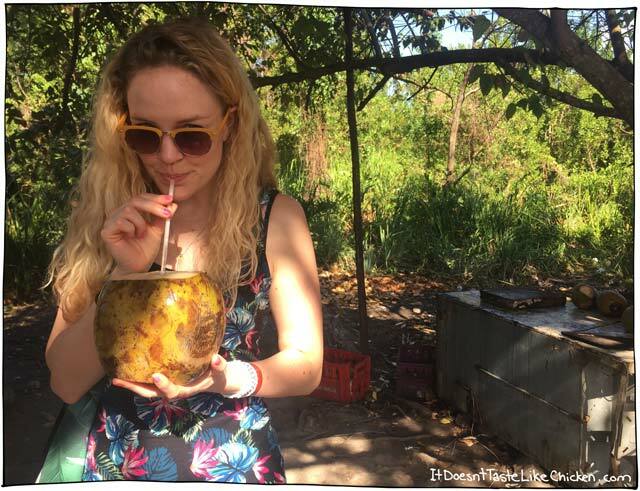 Our guy hacked away at it with a machete (the all-purpose tool in Jamaica), to make an opening so you can drink all the coconut water with a straw. When you are done with that (it’s a shocking amount of water) you hand it back to him, and he will split the coconut, make you a spoon from the coconut husk, and hand it back. Then you use the husk spoon to scoop out the flesh which is almost a jello-like texture. Omnomnom. Be sure to check out the video to see jelly coconuts in action! 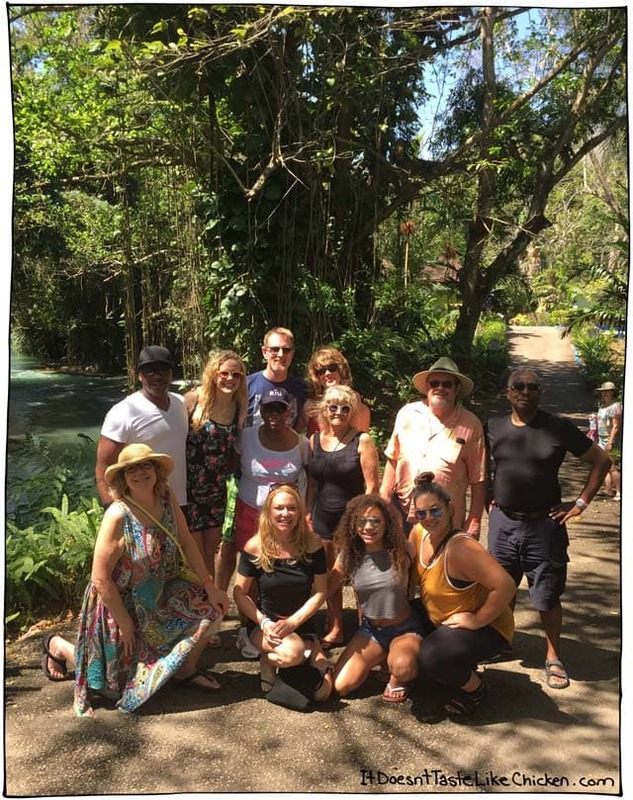 While, admittedly, we did a lot of swimming and a lot less exploring, we did go out as a group to this rafting trip on the Martha Brae river. 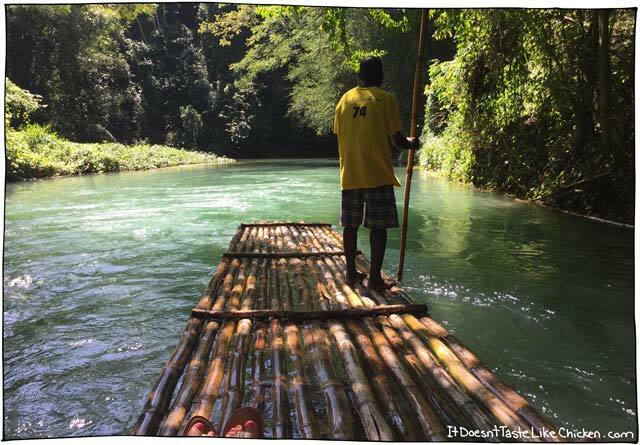 It was a 90 minute float down the river on a handmade bamboo raft that was steered by a guy using a stick. Oh so romantic. 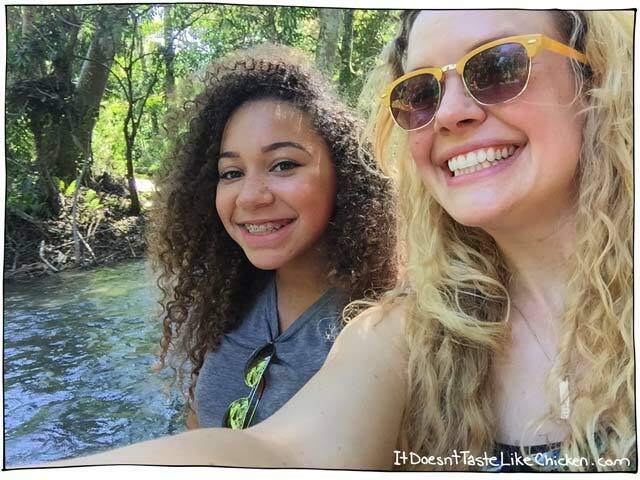 My romantic raft riding partner was my little cousin Zuzu. Our raft captain has been doing this for 32 years, that’s how old I am! He told us about the different plants we were passing, pointed out all of the fruit trees, and when one tree decided to rain beans on us (much to Zuzu’s horror… apparently she thought she would die via beans), he told us how the beans were the cows favourite because they were so sweet. Naturally, I tasted the bean goo he was referring to and it was indeed so sweet, it made your throat tickle and feel fuzzy… maybe I shouldn’t eat strange beans. (note: apparently I wore the same dress in every single picture… I swear I had other outfits)! See! 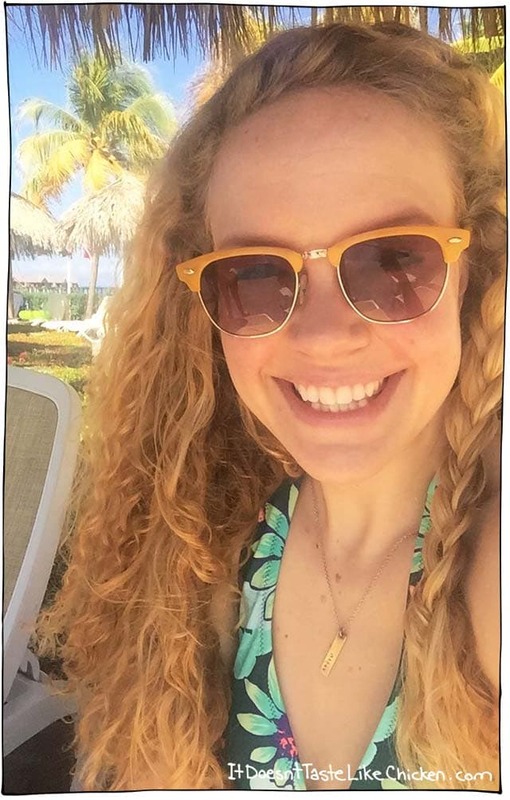 …Ok so that’s a bathing suit so it doesn’t really count… sigh. Reviewing all of these photos makes me wonder why I even left. Can’t we be on vacation all the time!? Ah well. Now onto the food! 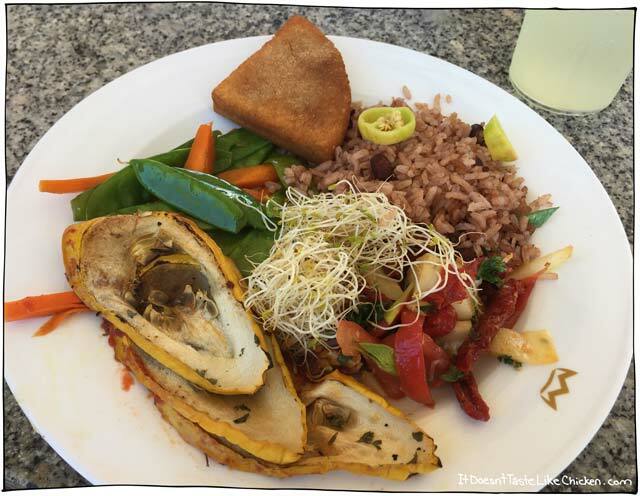 The RIU Montego Bay had a massive buffet that always had new discoveries. As I was one of 3 vegans on the trip (we’re slowly taking over), muhahaha! 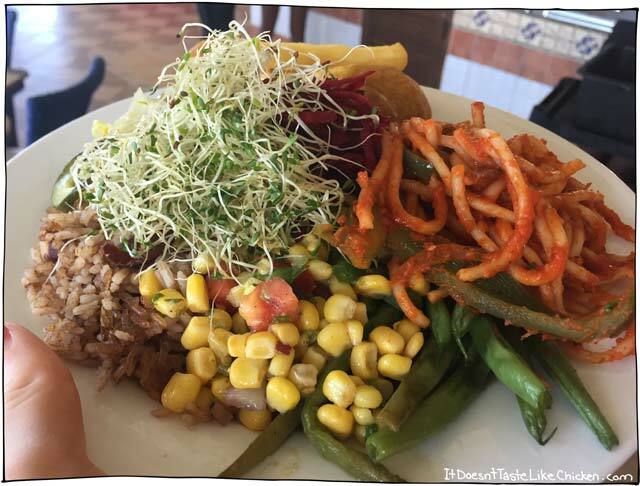 We were all very, very pleasantly surprised by the huge abundance of vegan options at every meal! I was constantly discovering new things. 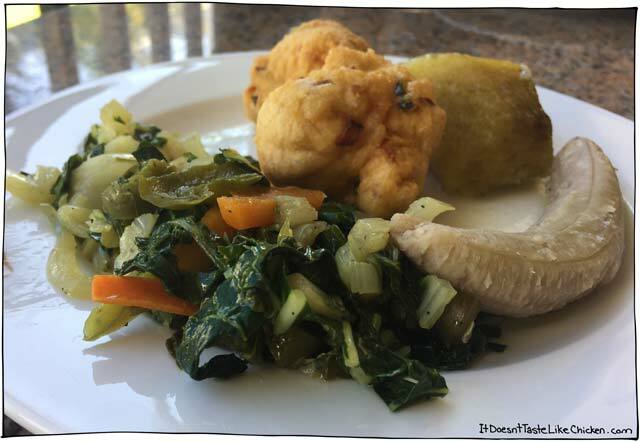 The plate above has a big helping of pokchoy greens (which are similar but different than bok choy), boiled green banana (which is kinda like eating a boiled potato), vegetable fritters, and boiled yam. There are also 3 other restaurants on the resort. I skipped the steak house (unsurprisingly), and the Italian restaurant, as the options weren’t great at either of those, but I did try the Asian restaurant one night which again had an abundance of options, including crispy fried tofu, veggie sushi, and all sorts of yummy stir-fried veggies. I wasn’t able to take a snap there as it was night, and I wasn’t about to travel with my lighting equipment. 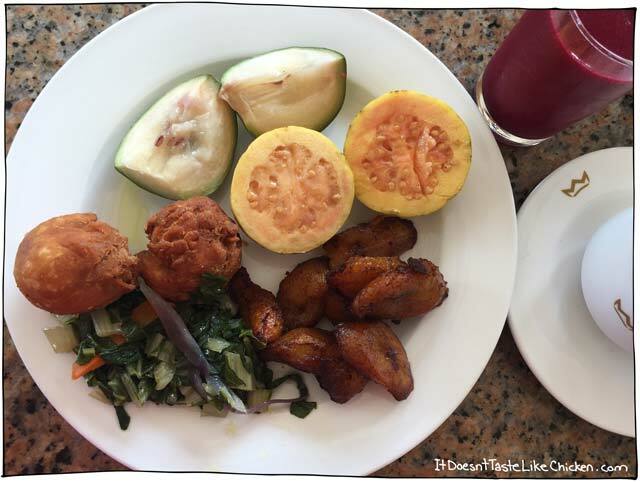 The plate above has fried dumplings, stewed cabbage, fried plantains (my fav), stewed pumpkin, purple yam, watermelon, and beet juice. If I was ever unsure if anything was vegan or not, all the chefs were right there behind the buffet preparing the food, so you could just ask them. Easy peasy. Luckily butter isn’t super traditional in Jamaican cuisine as the climate is too hot for it to keep well, so most things were cooked in oil. The plate above has grilled zucchini, peas and carrots, bammy bread (which is made from cassava root and is actually my new favourite thing), peas and rice, sun-dried tomato salad, spouts (just because), and pineapple juice. The buffets always had a huge fruit spread, salad bar, and traditional Jamaican spread (lots of which is vegan), but there was also many other stations that changed according to meal, and I am guessing day of the week as there was always new stuff being put out. So if you wanted pasta, burritos, or other things like that, they had that too. 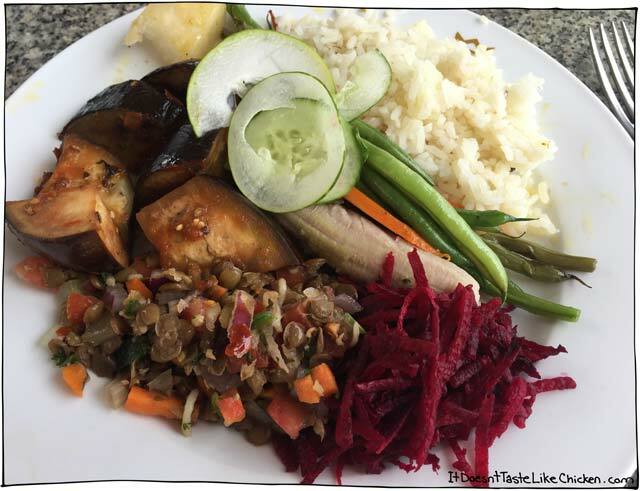 The plate above has stewed eggplant, boiled yams, rice, green beans, shredded beets, lentil salad, and cucumbers (just because). Every morning there was a juice bar station set up with an array of fresh juices being made on the spot! And after several days of black coffee (not my fav), I finally discovered a big pitcher of soy milk that wasn’t with the cows milk, but with the yogurt. Bizarre placement, but I was thrilled! 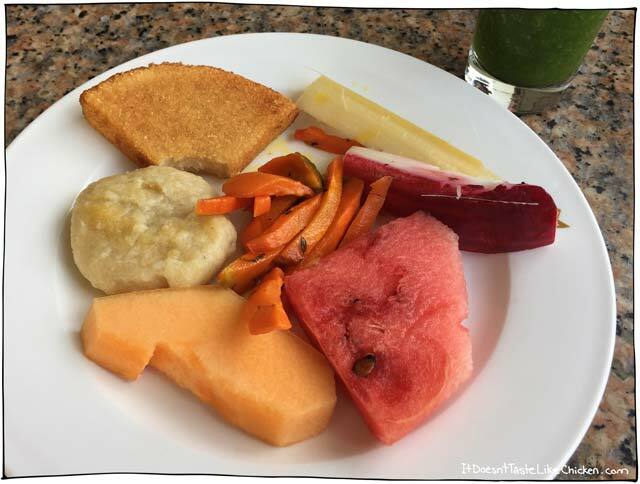 The plate above has boiled dumpling, bammy bread (which I couldn’t resist biting before I even sat down), sugar cane, Jamaican apple (which is kind of like a watery pear), watermelon, cantaloupe, stewed carrots, and spinach juice. 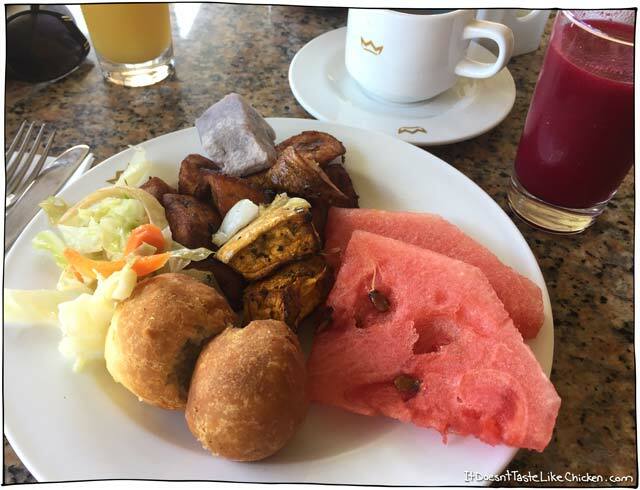 One of the most handy dandy things about travelling to Jamaica as vegan, is that the Rastafarian diet is called Ital and is totally vegan. 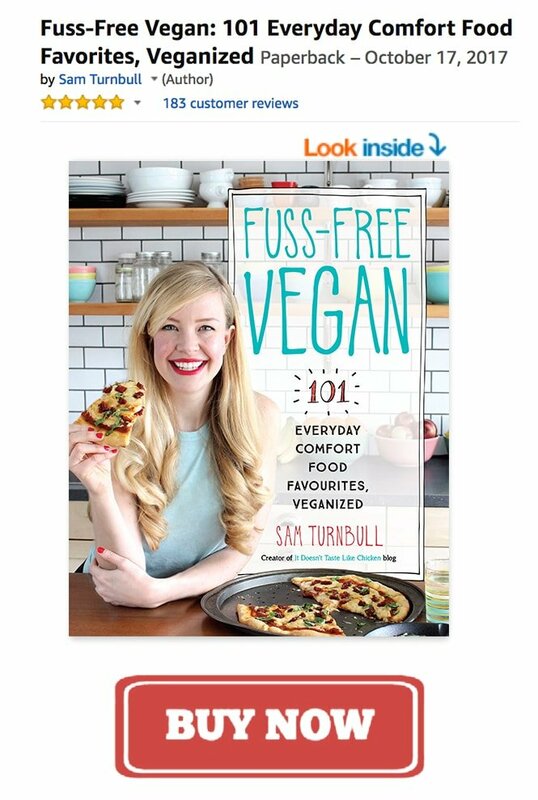 (Except sometimes they eat fish… although I personally have only seen vegan Ital food). So, you can ask people if there are Ital restaurants nearby, or explain your diet as such. The plate above has fried dumplings, star apple (which is this weird kinda jelly like fruit I seemed to love), guava, friend plantains, pokchoy greens, and beet juice. So I made a big mistake and left my visit to the nearest Ital restaurant to the last evening. The result? The place was already closed as it closes as 6. Poorly played Sam, poorly played. Blogging fail 101. So that was lame. Turns out I was having too much fun playing in the sun to organise such things ahead of time. But if the restaurants are anything like Ital Vital restaurant in Toronto, it would be sensational, because that place is one of my favourites. 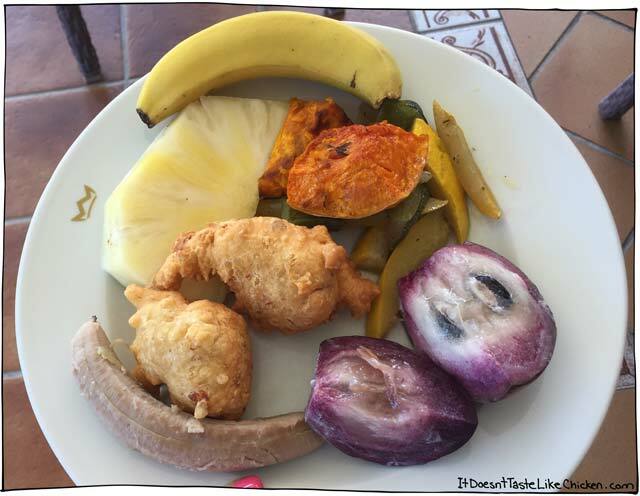 The plate above has boiled green banana, vegetable fritters (they were vegan, I asked), pineapple, a ripe banana, pumpkin, squash, and purple star apple (which is even better than the green kind). Overall, I was blown away with the food, the options I had to choose from, and how I totally felt belly full every single day. I wish I always had buffets of deliciousness! The plate above has peas and rice, sprouts, corn salad, green beans, spaghetti with tomato sauce, grated beets, and hiding behind was cucumber salad, and potato chips (because chips). So theres a taste of what my Jamaica trip was like. 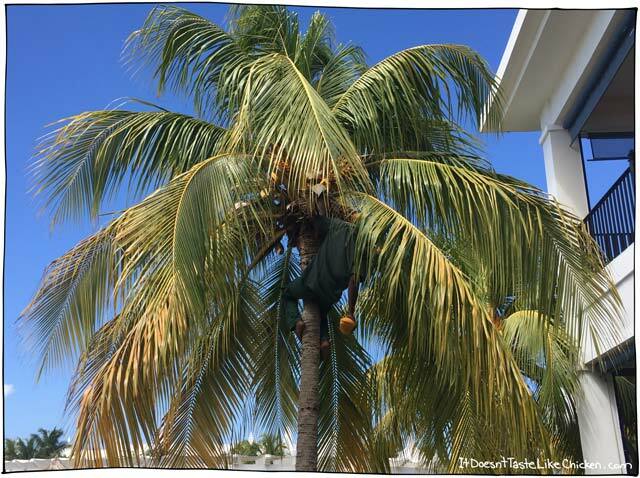 And here’s a guy climbing a palm tree, which I found to be super impressive. Jamaica, I miss you already!! Thanks for this post! I am traveling in a week and was FREAKING out about my coffee Hahah! You’re most welcome, glad you found it helpful! Thank you so much for posting this. I am travelling to an all-inclusive vacation in Montego Bay next year and I’ve been so worried about it. You’ve helped me feel a lot more relieved. Thank you again. Great information on what to eat on diet. This is the first time I have visited your site. Thanks for sharing! Have a terrific day! The food all looks so good, but reading the comments, now I want to go back to Toronto! Thanks for your video and post. Jamaica, my beautiful homeland. I miss all the wonderful food. I am in my 60s now and have never returned since arrival in Canada. In fact I am not far from Toronto. Sam, I love all your posts. You are adorable! So fun and energetic and cute. Keep sharing you wonderful recipes. Please give us a few more oil-free ones. Wow! Looks like an amazing trip. We’ll have to try Jamaica one day. We’re thinking of driving through Toronto this summer–taking the Canadian way from Vermont to Michigan so we’ll have to check out the Ital restaurant. Thanks for sharing–I’m feeling warm and sunny just seeing the beautiful beach and delicious looking food!